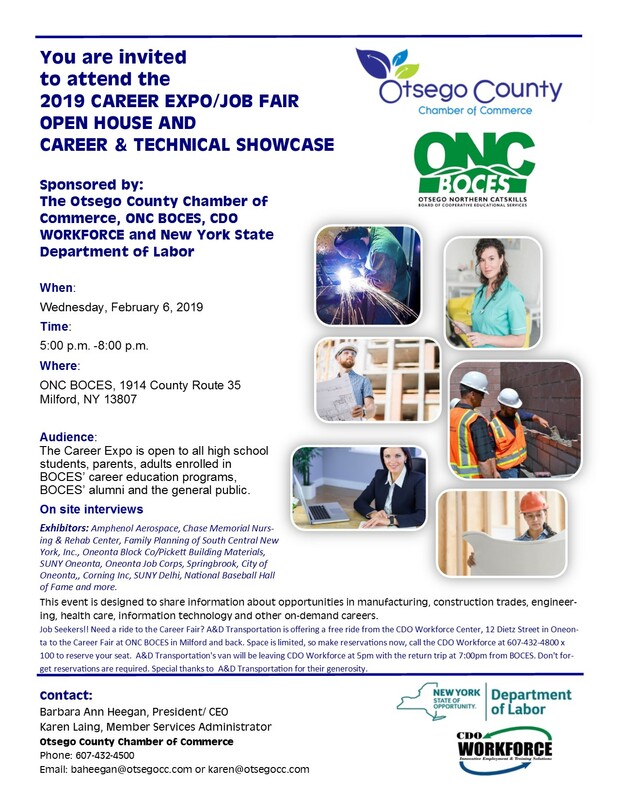 The Career Expo is open to all high school students, parents, adults enrolled in BOCES career education programs, BOCES alumni and the general public. This event is designed to share information about opportunities in manufacturing, construction trades, engineering, health care, information technology and other on-demand careers! Exhibitors include - Amphenol Aerospace, Chase Memorial Nursing & Rehab Center, Family Planning of South Central New York, Inc., Oneonta Block Co/Pickett Building Materials, SUNY Oneonta, Oneonta Job Corps, Springbrook, City of Oneonta, Corning Inc. SUNY Delhi, National Baseball of Fame and more!